3.9 out of 5 based on 102 bloggers and 10 commenters. 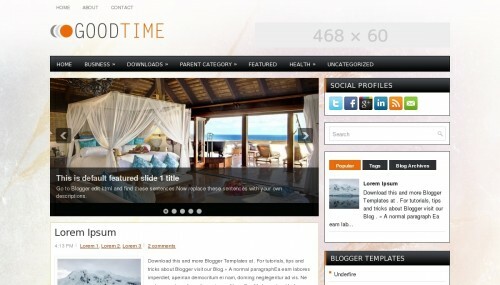 GoodTime is a free blogger template adapted from WordPress with 2 columns, right sidebar, grunge style, ads ready, footer columns, slider, social bookmarking icons, tabs and drop down menu. Excellent template for blogs about health and beauty, home and decoration or nature. I really liked this theme. It makes my blog looks professional. Thank you so much and sorry for my ignorance. thks for share it …. god job this is rely very nice site..
vry gd very usefull tamplet.. It is nice to read your post and you give wonderful information about online fashion. Please give more informaion about it.